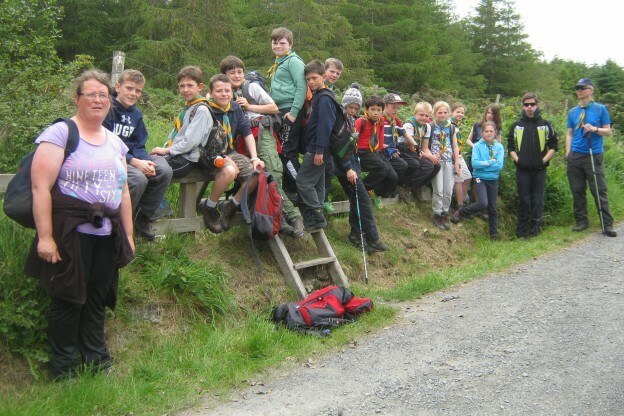 Eriu Cubs enjoyed a fantastic Summer Camp over the weekend of Fri 13th – 15th June. We camped with 18 adventurous cubs in the Beaver Field at Lough Dan and made great use of the Obstacle Course and Water Slide that skirted our campsite. On Fri night we started our Pioneering Project to teach the cubs some lashings and build a platform tent to hang out in during the camp. We started our campfire early to avoid the midgees and the cubs enjoyed toasting marshmallows and singing songs. Saturday morning we finished our Platform Tent and then set off on the long but lovely Lough Dan Loop hike, crossing two rivers en route. Sat night the Sixers and Seconders slept out in a bivvy up on a nearby hillside and the main camp enjoyed another campfire and more marshmallows. Sunday morning was glorious, warm and sunny, perfect for our crate building, archery and raft building. Then the cubs enjoyed the water slide before striking camp and heading home tired but happy. Thank you to all the helpful parents and our great assistants. This entry was posted in Eriú News on June 17, 2014 by Áine Ní Neachtáin.